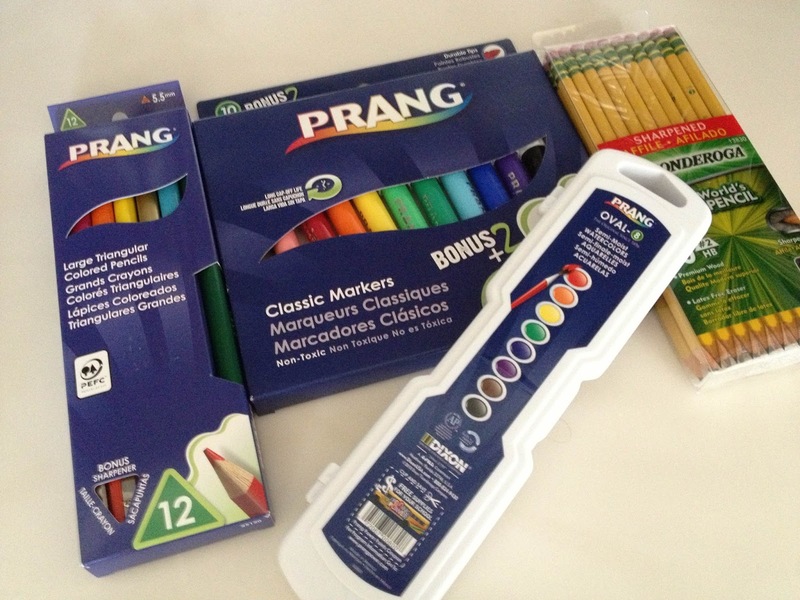 Pencils Books and Dirty Looks: Prang Review... Woo Hoo!! I was recently asked if I would be interested in reviewing Prang writing and art supplies from the Dixon Ticonderoga Company. Ummm... YES, PLEASE! 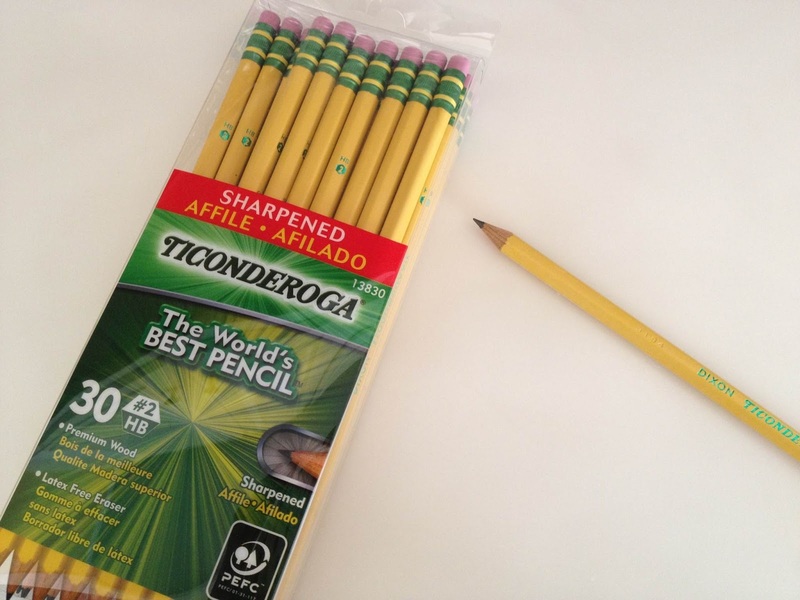 Ticonderoga are my all time favorite pencils ( I wish I could insist that all parents buy these pencils)! I reviewed the following products. My youngest daughter was as excited as I was to try out all the products. She did all the testing for me and told me her thoughts on each product. 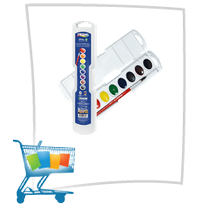 This marker set comes with 10 (plus two bonus) markers. My daughter really liked all the color choices (she was actually using the red when I took this picture). The marker was easy to hold in her hand because it wasn't too "chunky". She also liked the fine points of each marker compared to the competitors marker. The markers have a long cap-off life. Even if the cap is left off all day the marker will not dry out! We both loved these colored pencils! 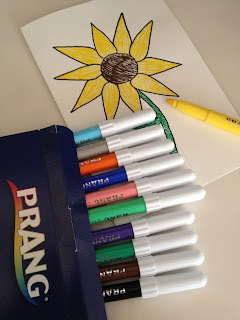 The triangular shape made them so easy to hold and color with. Also, the point of the pencil is thicker so it doesn't break as easily as the competitor. My daughter felt that the color was also darker than other colored pencils. 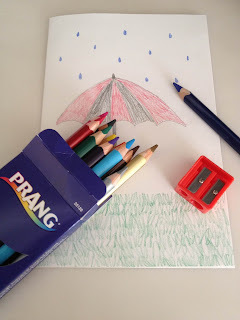 It was nice that a sharpener was included since the pencils are an odd shape! 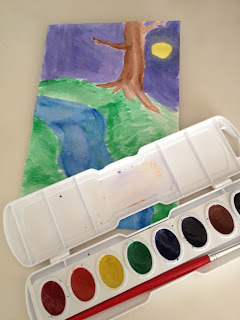 My daughter was most excited about the watercolors. She loves to paint! She liked the fact that paint was thicker than most. It didn't take as many coats of paint to make her picture. I liked the thickness of the bristles on the brush. The Prang paint colors were more realistic on paper than the competitors. The wide container made them mess free! I love it when parents send in Ticonderoga pencils instead of the cheap competitor brands! They really are the world's best pencils!! Not only do they write with a smooth finish, more importantly they do not break electric pencil sharpeners. These pencils sharpen perfect every time. It is really hard in elementary school to keep a pencil sharpener longer than a school year! I also like the fact that the pencils came sharpened! One less thing to do before the kids came on the first day of school! As a bonus to you for reading this blog post, Prang is offering a coupon for their Watercolors! Click on the picture below to print yours! Aww, what a great opportunity!